Elliotts range of Chem-Tech Chemical Splash Protective Clothing is made from a high performance, high quality 5 layer breathable fabric manufactured specifically for the requirements of chemical splash protection. The Chem-Tech range of fabrics allows vapour to transfer through the fabric while preventing liquid penetration by a variety of chemicals.Chem-Tech Chemical Splash Protective Clothing allows the body to "breathe", so your perspiration can evaporate reducing the possibility of heat stress. Many coated fabrics are non-breathable, and they do not allow moisture vapour through. Workers incur the risk of heat stress as this hinders the body's physiological cooling process. Chem-Tech Chemical Splash Protective Clothing can provide the wearer with valuable time to access an emergency shower in the case of an accidental chemical splash. High levels of comfort and protection. The Chem-Tech® range of fabrics allows vapour to transfer through the fabric while preventing liquid penetration by a variety of chemicals. Chem-Tech® Chemical Splash Protective Clothing allows the body to breathe, so your perspiration can evaporate reducing the possibility of heat stress and therefor improving wear comfort. Many coated fabrics are non-breathable, and they do not allow moisture vapour through. Workers incur the risk of heat stress as this hinders the body's physiological cooling process. 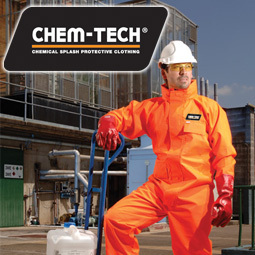 Chem-Tech® Chemical Splash Protective Clothing can provide the wearer with valuable time to access an emergency shower in the case of an accidental chemical splash. Chem-Tech® breathable chemical splash fabric has been tested to ISO-11092 for water vapour resistance. Water vapour resistance measures the ability of textile fabrics to transfer body heat and moisture vapour away from the body through protective fabric layers and shows the benefits of wearing garments which can reduce potential metabolic heat loss. Multi-purpose garments affording protection against chemical hazards and also as a high performance multi-layer high visibility breathable wet weather garment, exhibiting optimum waterproof and water repellent properties. New enhanced PTFE barrier technology. Chem-Tech® Chemical Splash Protective Clothing is made from a high performance, high quality 5 layer breathable fabric manufactured specifically for the requirements of chemical splash protection.